When I was a kid, beets were the one vegetable that I would not touch with a ten-foot pole! It was the 1970s and the only beets we had came in a can and I thought they were awful! But the moment I had fresh, roasted beets served with goat cheese, I was hooked. Now I can’t get enough of them! Earthy, sweet, gnarly-beautiful beets are made even sweeter by slowly roasting them in the oven with cinnamon sticks and bay leaves and marinated in a gingery-grapefruit vinaigrette. If ever there was a salad that makes you feel warm inside, then this is it! The weather is finally starting to warm up a bit, but it’s technically winter, so we can still take advantage of ripe, winter citrus, leafy greens and root vegetables. 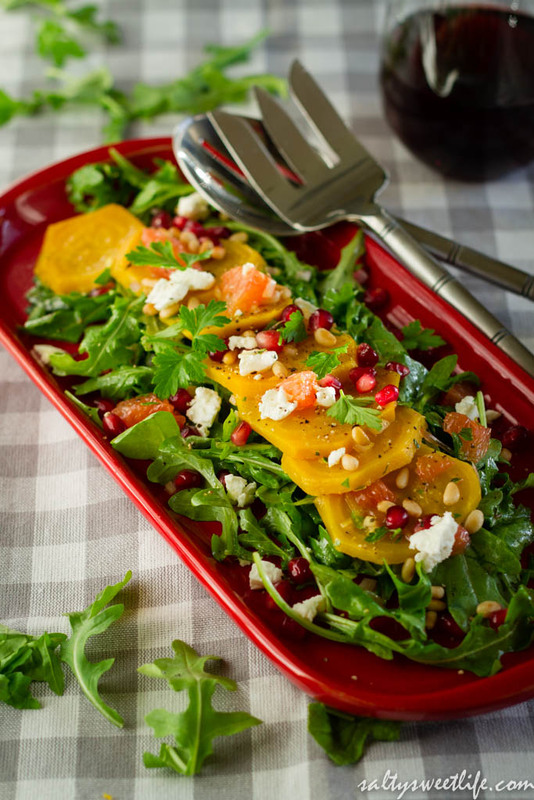 This salad beautifully bridges the gap between the long, cold winter and the warm sun of spring that’s just waiting around the corner! Golden beets are not always available, so when I see them at the market, I grab them. Milder than red beets, they are sweet, less messy and they make a beautiful presentation on a plate! Roasting them in the oven with cinnamon sticks and bay leaves has the added advantage of making the house smell so good! I like to roast the beets ahead of time so that they have enough time to cool before slicing. When I made these beets for a salad to serve at our Thanksgiving dinner, I roasted them a few days ahead of time and refrigerated them. 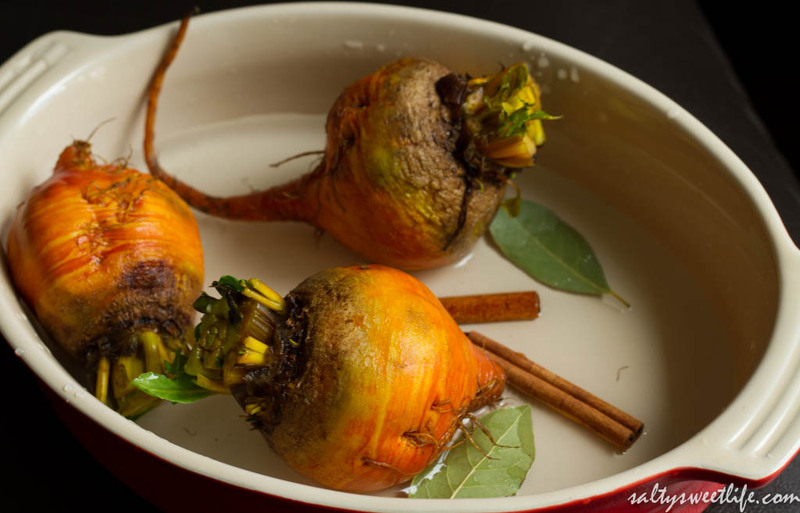 They are very forgiving, just know that if you are roasting both red and golden beets at the same time, store them separately to keep the red ones from staining the golden beets. 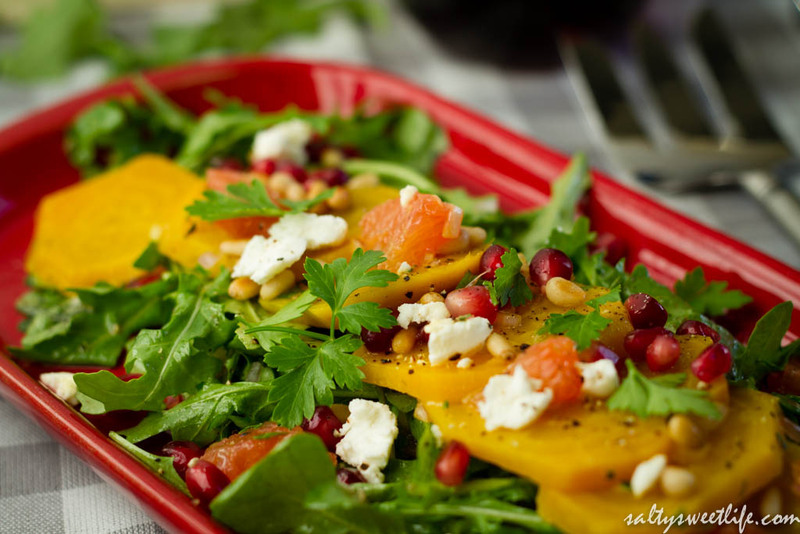 If you are lucky enough to find beets that still have their leafy tops, add the beet greens to the salad as well. Beet greens are delicious and so healthy! Place the beets, bay leaves and the cinnamon stick and water in a small oven-proof casserole dish. Prick the beets all over with a fork. Cover the pan tightly with foil and roast in the oven for 1 hour or until the beets are tender. After the beets are cool enough to touch, peel them and slice semi-thin with a mandolin or a sharp knife. In a small bowl, whisk together all of the ingredients except the oil. Allow the mixture to sit for about 10 minutes to allow the flavors to marry. Add the olive oil and whisk until the mixture is emulsified. Pour half of the mixture over the beets and marinate for about 20 minutes. Lightly toast the pine nuts in a dry frying pan for 3-4 minutes or until the pine nuts turn golden brown. Pine nuts can go from toasted to burnt really quickly, so whatever you do, don’t walk away from that pan! They burn so easily and the smell is worse than burnt popcorn in the company break room! This is speaking from experience! Remove the pine nuts from the heat and set aside. Section the grapefruit by removing the peel and the white pith with a very sharp knife. Working over the bowl of sliced beets, hold the grapefruit in one hand and with the knife in your other hand, cut alongside the membrane of each section allowing the sections to fall into bowl. Gently fold the grapefruit into the beets. Lightly dress the arugula with the remainder of the dressing and toss with your hands (you don’t have to use it all–the recipe makes about 1 cup of dressing). 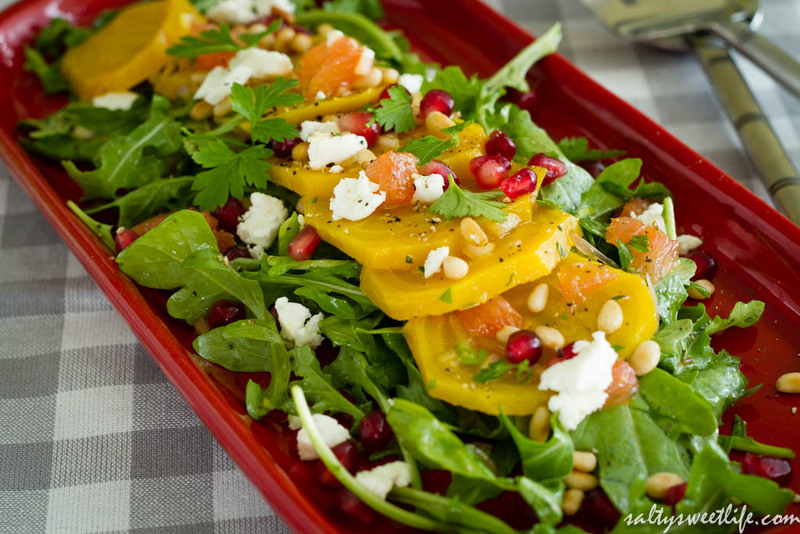 Top the arugula with the beets and grapefruit, then sprinkle with the pine nuts, goat cheese and pomegranate arils. Thank you so much! 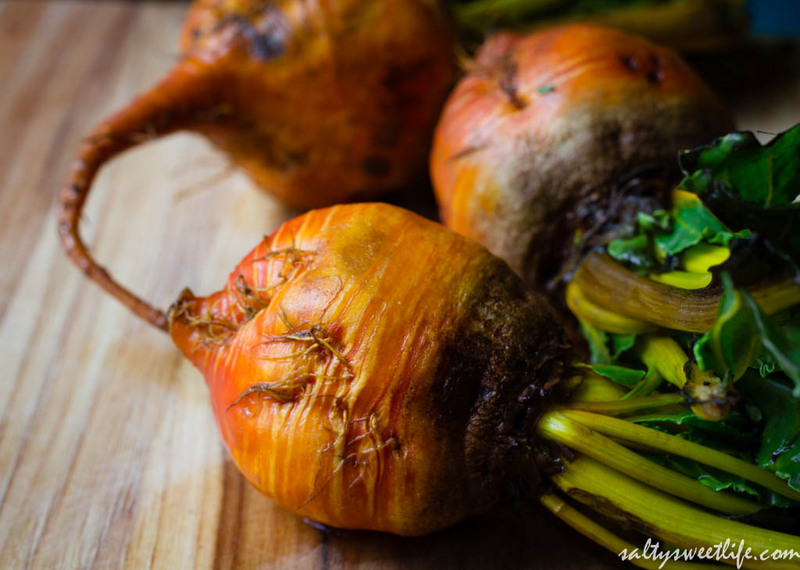 It will definitely work just great with red beets–I’ve cooked both using this same method! I don’t know that I’ve ever had golden beets. I’ll have to keep an eye out. Beautiful presentation, looks delicious! Thank you! 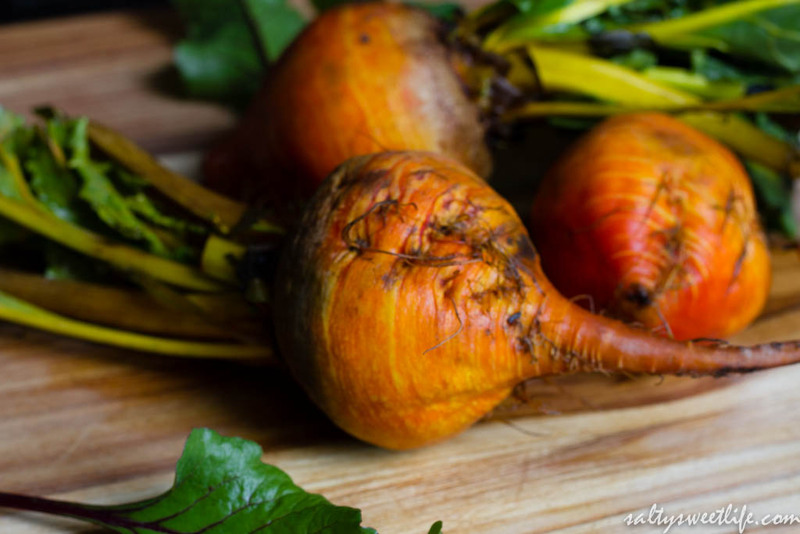 Definitely keep an eye out, but if you never find them, you can always use red beets instead!